There's something about the ways the Scandinavians do fashion. The style is synonymous with pared down but well made basics, tailored but effortless at the same time. A typical outfit would entail a trusty pair of blue jeans, a cotton crew neck t-shirt topped off with a structured jacket. This uncomplicated, unostentatious way of living is so popular it even has a name: Scandi-chic. 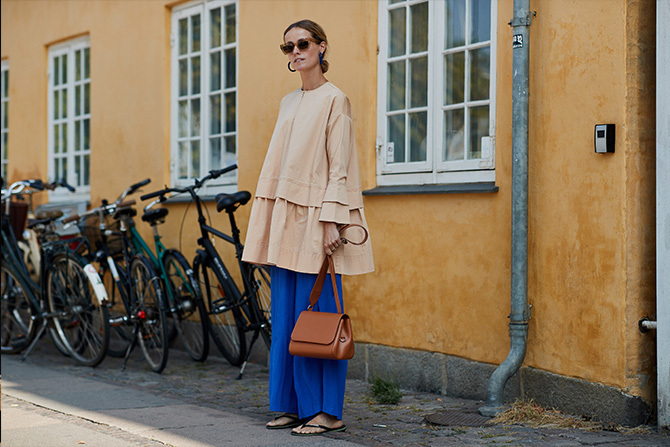 It is this nonchalant coolness that propelled Swedish favourite Acne Studios to fashion cult status as well as sneaker brand Eytys (a fellow Swede) and streetwear brand Han Kjøbenhavn (Danish), and resonates to normcore fans around the world. The formal pairing balances the informality of the chosen footwear. It's business on the top and (super) casual Friday at the bottom. It's all about the animal kingdom this year — unleash your wild side. Not a fan of the thong? Sliders are just as effective. Polish off with statement accessories like cat-eye sunglasses and oversized hoops for extra flair. For maxiumum effect, go with a fully printed dress. The length and volume of the apparel offsets the bareness of the footwear.